Caitlyn, a telepath, lives in a world where all paranormal talents are illegal. She is on the run from government ParaTroopers. When Caitlyn falls for Alex, a Normal, and discovers dangerous renegade Paranormals, she must choose between staying in hiding to protect herself or taking a stand to save the world. From the very first page I was hooked. The writing is gripping and grabs you by the collar and won't let you go. This dystopia is a world where any kind of paranormal ability is outlawed. Killing Paranormals is like a holiday event. Caitlyn is fearful for not only herself but her family but she also is sick of running and wants to be normal. The world that Rainfield gives us is haunting and terrifying. Patrols roam the streets and schools looking for Paras to turn in. What's even more scary is when Caitlyn runs into her long lost brother who has secrets of his own. She struggles with his radical beliefs but wonders if she should follow him. The complex family dynamics are played out in a real and very heartwrenching way. One other thing I really loved about this story is Rainfield doesn't give us stereotypical characters but rather ones that struggle with their own weaknesses and doubts. Caityln is attracted to a Normal and when he lets it slip he might be with those against Paras, we're shown the struggles and conflicts he goes through when he finds out Caityln's truth. Powerful writing shows us a glimpse of a horrific world that is complete with hate and paranoia. Though most are brainwashed there is still hope for a better world. I couldn't put this story down. Highly recommended. 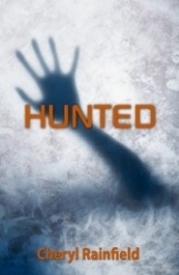 HUNTED comes alive on page one. It engaged me throughout with intrigue and a fast-pace that made the book unputdownable. Although a dystopian, this story was so deeply embedded in a contemporary setting that it became a believable allegory for the issues that teens (we all) face in today's society - racism, sexism, homophobia, ageism, bullying...you name it. Rainfield put these issues into HUNTED by making it a story of bigotry in the most fascinating of ways--Caitlyn is a teen telepath. Telepaths are to be feared and loathed…they are other than normal (which is, incidentally, exactly what the ‘normal’ people in the story are called). From the onset, I was reminded of David and Sophie of my childhood favourite, The Chrysalids by John Wyndham. As the story opens, the reader is immediately drawn to teenager Caitlyn, and her mother, who are on the run. Always on the move, they're trying to stay one step ahead of the ParaTroopers who are out to capture all paranormals…to either enslave, imprison or kill. Although Caitlyn's mom is also a Para, her powers are completely suppressed. It is up to Caitlyn to keep in touch with the network of para helpers set up to help the underground paras navigate in a world where they are neither accepted nor wanted. DIVERSITY. This issue was tackled full on in Rainfield's story. Through Caitlyn's eyes the reader is challenged to accept and celebrate the difference that every man, woman and child brings to the table. The uniqueness in this story is that the pacing and the stakes are so encompassing that the issues don't bog down the enjoyment. It's a fine line to weave a story focusing on issues without beating the reader over the head with them. Rainfield definitely accomplishes it. When Caitlyn and her mom stop in a new town, she is warned by her mother not to get too close to anyone. She must always live on the outskirts of the community while maintaining a convincingly ‘normal’ life inside of it. I can't imagine how hard this would be for a teenager. If they want to have any peace, though, Caitlyn must follow her mother's rules. Nobody can find out that she is a para. Once you start getting close to people, your secret walls start to rapidly deteriorate. Enter Rachel and Alex. Two strong characters I thoroughly enjoyed. Alex, strong and capable, is a typical teenage boy. I loved that Caitlyn could read Alex's thoughts and see that he liked her. It was nice to see that vulnerable side of a boy’s feelings toward a girl. It was a nicely played addition to the story. And Rachel, who is a strong-willed likeable character, also has feelings for Caitlyn. When she realizes the feelings are not reciprocated, the two become friends. But there is an intense loyal protective aura that comes off of Rachel. The reader quickly understands that, on her watch, no harm or foul will come to Caitlyn. Caitlyn has a past filled with loss and despair. In the para riots, she lost both her father and her brother. Her peace-loving level-headed father was murdered and her brother, Daniel, was kidnapped during the height of the riots. It is in this new town that Caitlyn discovers Daniel. This is where Rainfield tackles yet another issue—cult brainwashing. The Daniel who was kidnapped is not the Daniel she encounters in this new town. Though a para-slave of the powers that be, he is also part of an underground movement of rogue paras out to claim the world away from the Normals…at any cost. I want to tell you everything that happens in HUNTED. I want to gush about every scene and share with you the excitement of the execution of the story…but I will stop here. Let me just say that it’s a must read ride. Get ready to cheer for Caitlyn. If you have ever felt like an outsider, you will love this book. You will understand this book. You will walk a mile in Caitlyn's shoes and you will know the adversity she lives with through the unravelling of Hunted. You will root for her, and you will want to see both the government and its potential coup d'état movement fail miserably. I have one piece of advice for you---enjoy the ride!